One town, Santa Olga, has been completely destroyed by the blaze. Even by the recent unprecedented wild fires in the US and Canada last summer an area of wild fires in Chile's central region is taking on anything in comparison. 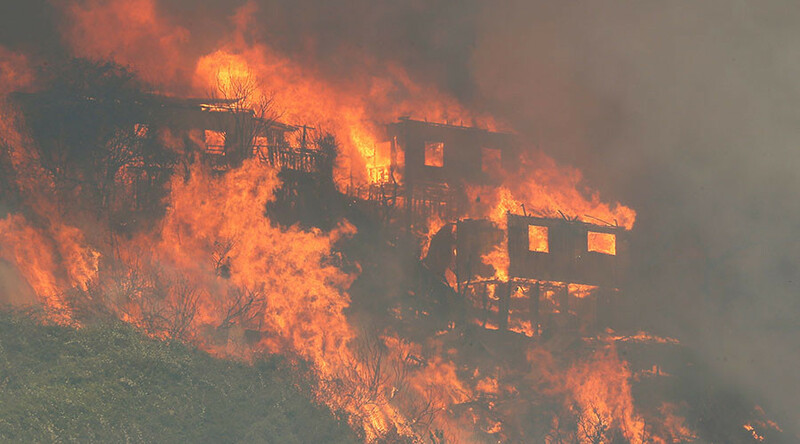 It’s been described as Dante's Inferno; more than 90 wildfires have broken out in the past few weeks and have spread rapidly across vegetation that has been dried by unseasonably high temperatures. Many regions have suffered heatwaves. Santiago registered a record 37C on Wednesday. An entire town has been consumed by flames in Chile as unusually hot, dry weather undermined efforts to combat the worst forest fires in the country’s recent history. One body was later recovered from the ruins. Two people are missing, but most of the residents were evacuated unharmed. Few will have a home to return to. At least four firefighters have been killed in the battle to control the blazes. Including police and civilians, the overall death toll is now seven, according to local media. The economic impact is still to be calculated. According to the National Forestry Corporation, 238,000 hectares of forests in central and southern Chile have been burned, forcing the evacuation of at least 4,000 people and damaging farms, cattle ranches and vineyards. More than 1,000 buildings, including schools, nurseries, shops and a post office were destroyed in Santa Olga, the biggest of several communities to be reduced to ashes in the Maule region. More international help has been arriving in Chile to help the country fight the worst wildfire in the country's modern history. Russia has sent a super-tanker aircraft capable of carrying tons of water to douse the fires. The series of fast-spreading fires mostly in Chile's central region, are being fanned by strong winds, high temperatures and a prolonged drought. Also, the super-tanker mentioned was sent from the U.S. by Walmart. Russia sent some smaller planes. Why don't they use their HAARP to control the weather?